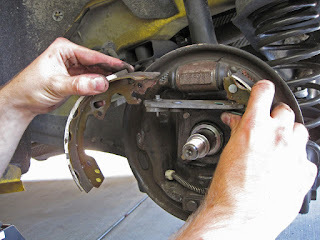 If you are driving a used car, you will want to make sure your brakes are in working order. It is important to have your brakes repaired as soon as you notice that there may be a problem. By failing to act quickly at the first sign of a problem, a routine pad or drum replacement can turn into a more expensive repair that requires more repairs and additional parts. Even more, failure to repair your brakes can cause your brakes to fail when you least expect it. A telltale sign of a rear brake problem is a high-pitched screech when you apply your brakes. This is because the brake pads/drums have worn down to a metal shim that is called an indicator. If ignored, eventually the sound will change to a grinding sound, which means you could be damaging your rotors. Some newer vehicles have an indicator light on the dashboard that is meant to alert the driver that there is a problem with their brakes. If you feel a vibration or a pulsating sensation in your brake pedal, it could be a sign that your brakes need to be replaced. You may also feel that your car is pulling to one side. These issues could also mean that your car is out of alignment, but for safety’s sake, you should also have your brakes checked. If you hear or feel anything wrong with your brakes, don’t wait! Take your car to one of the trusted service centers in the Olympia Auto Mall. You can visit our website today for the most reliable used cars in Olympia!